DA Form 2142 or the "Pay Inquiry" is a Department of the Army-issued form used by and within the United States Military. The form - often incorrectly referred to as the DD form 2142 - was last revised on April 1, 1982. Download an up-to-date fillable DA Form 2142 down below in PDF-format or look it up on the Army Publishing Directorate website. 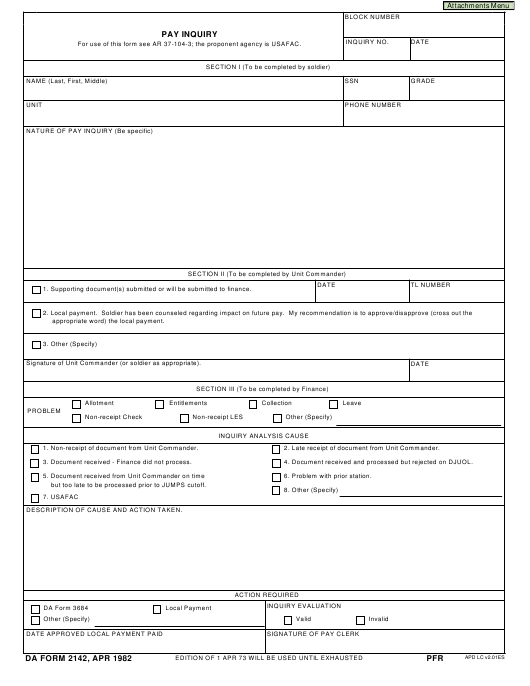 For use of this form see AR 37-104-3; the proponent agency is USAFAC. 1. Supporting document(s) submitted or will be submitted to finance. appropriate word) the local payment. Signature of Unit Commander (or soldier as appropriate). 1. Non-receipt of document from Unit Commander. 2. Late receipt of document from Unit Commander. 3. Document received - Finance did not process. 4. Document received and processed but rejected on DJUOL. 6. Problem with prior station. but too late to be processed prior to JUMPS cutoff. DESCRIPTION OF CAUSE AND ACTION TAKEN.